If you have acne, you probably know that sometimes treatment just doesn’t work. In fact, once in a while acne treatments even make your skin worse. When acne treatment produces the oozy, slimy, painful symptoms we usually associate with eczema, the underlying problem typically is damage to the stratum corneum, the protective barrier of the skin. Fortunately, for every kind of treatment-induced acne problem, there is an easy solution. 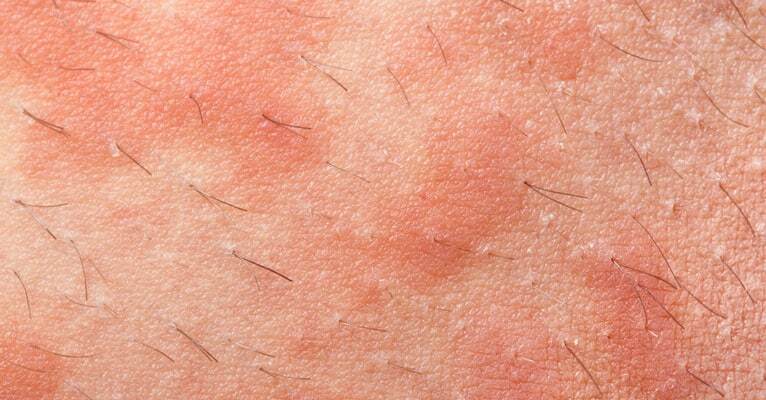 Eczema is one of the common side effects of acne treatments. Benzoyl peroxide is basic to the medical treatment of acne. Acne bacteria don’t become resistant to it, and it kills the overwhelming majority of bacteria on the skin in 48 hours or less. Benzoyl peroxide does not, however, heal inflammation of the skin, and lots of users simply cannot tolerate any benzoyl peroxide product with a concentration of more than 2%, without redness, itching, irritation, and sometimes even oozing of the skin. A few people can’t even tolerate the 2% concentration of benzoyl peroxide. Skin care researchers have had difficulty understanding why benzoyl peroxide should cause allergy-like effects when very, very few people have allergies to it. You are far more likely to be allergic to an essential oil, a perfume, a fragrance, or even another anti-acne chemical that you are likely to be allergic to benzoyl peroxide. But scientists with the Global Alliance to Improve Outcomes in Acne have come up with an explanation. Benzoyl peroxide, it turns out, doesn’t just kill bacteria that hide in the neck and base of skin pores. It also changes the way the skin retains water, increasing a phenomenon scientists call transepidermal water loss, or TEWL. It also changes the way the basal layer of the skin uses the form of vitamin E known as alpha-tocopherol, the kind of vitamin E most likely to be included in your daily vitamins and in your skin care products. The key to getting good results with benzoyl peroxide, which is extremely effective against acne bacteria, is keeping your skin hydrated and its vitamin E levels high. To do this, use a moisturizer that contains natural vitamin E, such as thin layer of a jojoba oil product that contains vitamin E, or, if you have especially oily skin, a water-based moisturizer that also lists vitamin E or alpha-tocopherol as one of its ingredients. Whatever you do, don’t use any kind of alcohol-based product on your skin while you are using benzoyl peroxide. Many acne sufferers, particularly people who have cystic acne, find the initial benefits of Retin-A to be almost miraculous. Retin-A, known generically as all-trans retinoic acid or tretinoin, and marketed as Aberela, Airol, Renova,Atralin, Retin-A, Avita, Retacnyl, Refissa, ReTrieve, Stieva-A, and tretinoin topical, opens up acne-affected pores that have been covered up by healthy skin. It offers a non-surgical approach for treating cystic acne by stimulating the growth of skin so that it literally opens itself over long-clogged pores, allowing them to drain and heal. Unfortunately, that’s not quite all Retin-A does. This commonly prescribed acne treatment also dissolves the “glue” that holds skin cells together in a layer known as the stratum spinosum. Acne experts usually don’t talk about this layer of skin, comprised of “prickle cells” and monofilaments, which holds the outer layer of skin, the stratum corneum, to the regenerative layer of the skin, the basal cell layer. That’s because this layer of skin doesn’t get infected, and for a long time it was thought not to be particularly important to the progression or inhibition of the disease. But at the same time Retin-A stimulates the basal cell layer to produce new skin cells, it inhibits the production of strengthening fibers in the stratum spinosum, and it causes the production of “nonmucin glycoconjugates,” which are basically stick-’em that isn’t sticky. This makes skin flake and peel. For dealing with the side effects of Retin-A, it isn’t enough to keep the moisturized and to give it vitamin E, although that helps. It’s also important to use products that provide “skin equivalent” compounds that are usually labeled as ceramides. You need to use moisturizer, too, but for best results, supplement your Retin-A treatment with both Vitamin E moisturizer and ceramides. But avoid the use of any products that contain alcohol (“rubbing alcohol,” also known as isopropyl alcohol), perfumes, or fragrances. An ironic side effect of taking antibiotics to prevent breakouts sometimes is an even worse breakout. Sometimes this is just a matter of the doctor prescribing the wrong antibiotic, or the patient not taking the full course of treatment. The drug kills the weakest bacteria first. If antibiotic treatment is stopped too soon, then the more aggressive bacteria don’t have any competition and they can multiply and do even more damage. Sometimes, unfortunately, even the “right” antibiotic in the right dose taken for the right number of days can result in a new breakout. When this happens, the problem usually is a migration of non-acne bacteria, such as strep bacteria from the throat, to the skin. Bacteria from the nose and throat land on the face, don’t have any competition, and cause acne-like infections. If you have something that’s closer to a blister than a pimple after taking an antibiotic, this may be the problem. The solution, fortunately, isn’t especially difficult. Make sure you don’t contaminate your face. Picking your nose is a social no-no, and it’s not a good health practice, either. Blow your nose into a tissue that you discard, rather than into a handkerchief you use over and over again. And use a second line of treatment such as a mild concentration of benzoyl peroxide (2% or less) along with a moisturizer and vitamin E to prevent secondary infections of your skin. Microdermabrasion literally rubs your acne away. Tiny particles of aluminum oxide or corundum blast away hardened oils and let your pores drain naturally. But sometimes acne breaks out even worse a day or two after the treatment. When this happens, the problem is that acne bacteria that had been trapped in the bottom of a pore suddenly have room to expand. Fortunately, there is an easy, drug-free way to prevent this. When you have microdermabrasion, or you use a microdermabrasion cream, also treat your skin with red light. The red light penetrates your skin to the depth of the pore, killing the acne bacteria inside. Then when your pores are free to drain again, dead bacteria come out with impacted oils so the pore stays open.